Rated: R for bloody violence, disturbing images, language and some sexual content. The 1976 adaptation of Stephen King’s novel “Carrie” is well known enough that a remake seems unnecessary. Director Kimberly Peirce (“Boys Don’t Cry”) proves that wrong, modernizing the setting, highlighting the modern tropes in the story, and drawing fantastic performances out of her cast. She also drenches it with a bleak, heartbreaking horror. With the focus on bullying in recent years, “Carrie” is a very timely film, but also one not for the faint of heart. Carrie White (Chloë Grace Moretz) is a senior in high school. 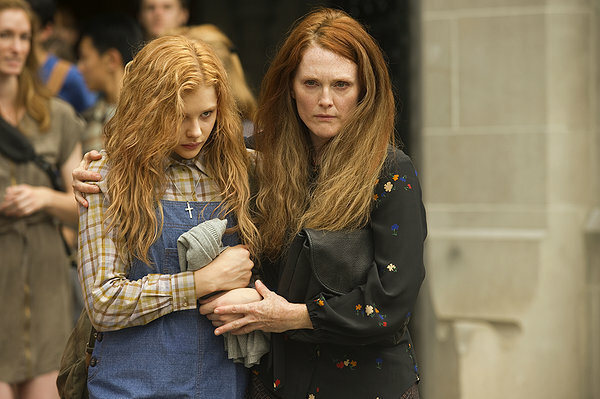 Her fanatically-religious mother Margaret (Julianne Moore) abuses her physically and mentally, and the result is that Carrie is shunned at school and bullied viciously by the popular girls (and only slightly-less-viciously by everyone else). These early scenes are some of the most horrifying — the awful things her mother and classmates do, and how little anybody does about it. When Carrie discovers that she is developing telekinetic powers, she is elated and soon figures out how to control them. Unfortunately, events at her senior prom finally push her far enough that she lashes out and uses them to punish everyone who has wronged her. Moretz has a difficult line to walk in her performance, but manages it. Carrie goes through a wide range of emotions and states, but she handles them well. The effects of long-term emotional abuse are complex and often surprising, and this young actress makes them believable. As Carrie’s mother, Moore has a difficult role herself. Margaret is deeply warped, but Moore makes her bizarre beliefs and behaviors not only consistent but believable. The other roles are simpler, drawn in broad strokes. Ansel Elgort and Gabriella Wilde stand out as two popular kids who struggle to reconcile their place in the popular clique with basic human decency. Portia Doubleday and Alex Russel have to do everything short of twirling a villainous mustache, but they do it with a conviction that stops just shy of going over the line into ludicrous. The two prominent adults at school, the principal (Barry Shabaka Henley) and girls’ gym coach (Judy Greer), mean well but are stupendously ineffective, and the performances bring that tension to life. Ultimately, what I found most horrific in the film was not the blood- and chaos-filled third act but the lead-up to it. High schoolers can be incredibly vicious, and watching Carrie’s treatment at school (not to mention at home) is painful because it rings true. The ringleader of the popular girls even takes a video of a particularly nasty episode and posts it online. Carrie’s eventual loss of control and the ensuing massacre are intense, but what made them frightening for me is what they have to say about the results of bullying. This comes up more than once — watch for one of the popular kids talking about beating up a kid who used to bully him. “Carrie” is less a horror movie about an enraged telekinetic teenager and more a horror movie about the everyday evils that surround us — and that’s what makes it genuinely scary.